Before diving into anything political related, this book is still called Green Lantern and I have to give a applause to Venditti for putting Hal on this road of instability. Now one might might bring that Hal should have been on this road since he found out the Corps was missing, I’ll make the argument that potentially losing his nephew is much more personal to Hal. Therefore seeing Hal in his current state makes complete sense. Echoing my last review, this issue solidifies that Venditti is slightly recreating the events that lead to the creation of Parallax. The huge difference being the two iterations is Venditti actually has had time to shape and mold Hal into his current state. However despite the fact that Venditti has Hal retreading similar ground, the character keeps his emotions in check long enough to save the United Nations. Venditti might want to rectify the mistakes that were initially made by DC editorial in 1992/93. I could be completely off base in what Venditti is doing but it all seems to coincidental for me to not see some connection to Emerald Twilight, that and the fiftieth issue is now upon us. When it comes to Green Lantern villains there’s an expectation of something to do with aliens, after all they are an intergalactic police force. 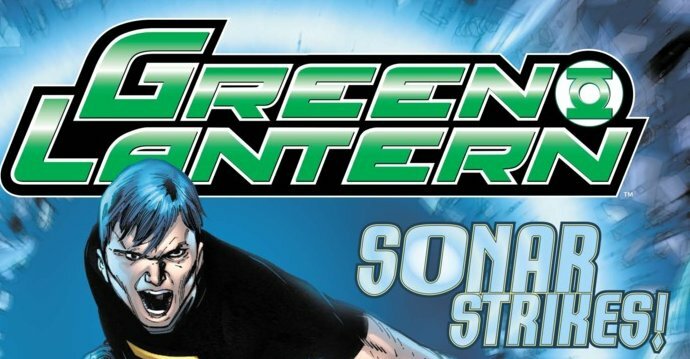 Now enter this new interpretation of Sonar, a terrorist (or freedom fighter depending on your views) who brings out the human element of Hal Jordan to light. The threat of Sonar feels tangible, because of how similar his actions are to what a person might read in a news headline. The temptation to make Sonar a carbon copy of any terrorist organization is there, but it seems that Venditti is intent of giving him his own identity. It’ll be interesting to see where Sonar as a character evolves from here. In short despite being a normal person Venditti has made a villain who hits close to him for both Hal and the reader, which makes him a dangerous threat to a man who can’t completely control his emotions. Martin Coccolo returns as the main artist and to once again to focus on Sonar, his rendition added to the mystique of him. While Sonar’s posture does lean towards Dr.Claw from Inspector Gadget (he even has a shadow that covers his face), it’s Coccolo’s depiction of pure anger on his face that tells his story. Seeing both Hal and Sonar deal with elements outside of their control and how their facial expressions reflect that bring an almost similarity between the two opposing forces, to an extant of course. Lastly, Billy Tan was the artist for the last page and despite it being a repeat of previous two issues, Tan angling it to make it seem like a hurricane was hovering over Coast City, the calm before the storm. I honestly didn’t know it was a Tan page because the line worked didn’t have his distinct look, then I noticed that Mark Irwin inked that page and Tan’s pages always look better under Irwin’s inks. Another solid issue from Venditti and crew as the recreation of Emerald Twilight continues. A lot of pieces have been set for the fiftieth issue of Green Lantern, it’ll be interesting to see how Robert manages to bring it all together in the next issue.